The John Henry legend tells of the strong black worker who won a contest against a steam-powered drill during the railroad-building era of the late 19th century. The Greenbrier’s extensive guest list has included politicians, royalty, athletes, military leaders, writers, performers, and many others. This exhibit of notable visitors was developed by Greenbrier historian Robert Conte, author of The History of The Greenbrier: America’s Resort. View our article on The Greenbrier. Charleston’s historic houses can be found in every neighborhood and come in all shapes and styles. Some are historic for the person who once lived there, while others are historic because of their age and architectural significance. This exhibit presents more than 60 of these houses. These postcards illustrate how much Charleston has changed in the past century or so. Many landmarks—such as the Kearse Theater and Charleston High School—have come and gone, but other familiar buildings remain. These postcards are from the collection of Stan Cohen, who is the co-author, with Richard Andre, of Kanawha County Images and Kanawha County Images, Volume 2. Most of today’s motorists prefer to stick to the easier, far quicker driving offered by Interstate 64. But those travelers who are willing to take their time and instead drive the two-lane blacktop of West Virginia’s Midland Trail can get a glimpse into history that’s denied those who hurry along the super-highway. 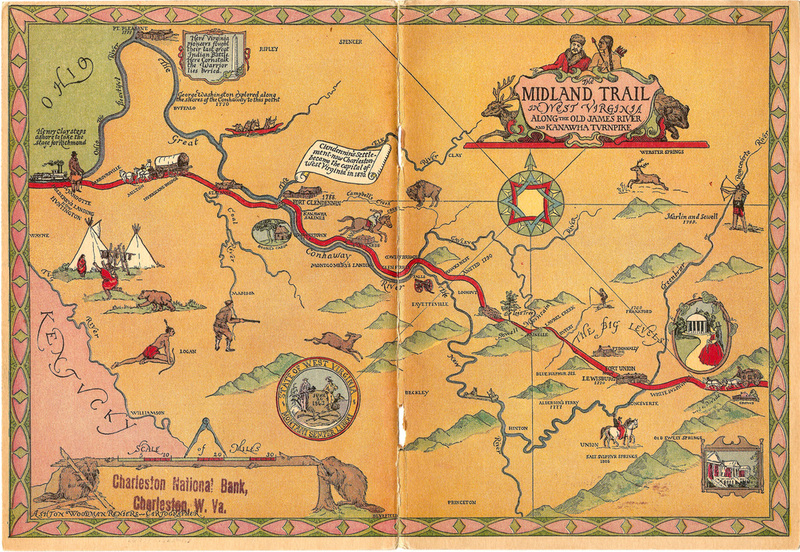 The Midland Trail is more than a road, it’s a virtual history book. Originally a rude pathway worn by buffalo and the early pioneers, it stretches from White Sulphur Springs westward to Kenova, zigzagging along rivers, over mountains and through lush valleys. Along the way it touches just about every aspect and time period of West Virginia’s story: coal mines and chemical plants, Civil War battlefields and historic churches, and ancient Native American burial mounds. Over the decades, the Midland Trail has had many names. It’s been known as the Buffalo Trail, the Lewis Trail, the Old Virginia State Road, the James River & Kanawha Turnpike, the Midland Trail, and, ultimately, U.S. 60. As it makes its way across West Virginia, the Midland Trail travels through six of the state’s 55 counties. In the east, the first of these is Greenbrier County. The Midland Trail then travels through Fayette, Kanawha, Putnam, Cabell and Wayne counties. Getting there: Today the Midland Trail is U. S. Route 60, which closely parallels Interstate 64 from the Virginia line to the Sam Black Church exit and again from Charleston to the Kentucky line. It may be accessed at many points along these sections, and where it crosses U. S. 19 (Appalachian Corridor L) north of Fayetteville.